Industry insiders point out potential flaws in a federal plan to develop a national program that would monitor patient safety problems in HIT systems. The HIT Policy Committee’s call to establish a national program to monitor patient safety issues stemming from HIT system use has been met with mixed reactions from various industry sectors. While there is agreement that some sort of safety tracking system is a necessary extension of the broader adoption of HIT, there are grave concerns about the validity of the data and how they would be maintained and utilized. 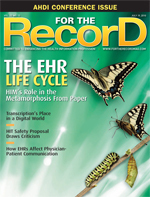 Though the details have yet to be hammered out, in April the HIT Policy Committee recommended that the Office of the National Coordinator (ONC) create a national transparent database to which providers would report errors and safety issues arising from the use of EMRs, computerized physician order entry (CPOE) systems, and other forms of HIT. Reports would cover all HIT systems, encompass multiple factors, including usability, processes, and training, and would be submitted confidentially without liability. The recommendation gave rise to a number of questions, the most prominent of which is whether such a system is even needed. The answer for many is yes, as long as it is designed to collect data on true IT errors and is used to improve rather than punish. “I don’t think it’s a good idea for the industry in question to say ‘no, I don’t need it’ when we know that there are incidents. … Part of it is perception. To say there isn’t a problem is not realistic, so how can anyone realistically object to it?” says Bill Spooner, chief information officer of Sharp HealthCare, a San Diego-based regional healthcare delivery system that includes four acute-care hospitals, three specialty hospitals, two medical groups, and a health plan. Noting that the proposed system could be similar to the Aviation Safety Information Analysis and Sharing (ASIAS) system that, under the auspices of the Federal Aviation Administration in collaboration with airlines, collects and analyzes safety and incident data, Spooner says success or failure is likely to depend on how the data are ultimately utilized. Spooner notes that the ASIAS system has successfully introduced transparency and enhanced air travel safety. However, there are enough significant differences between the two industries that lead him to question whether the ASIAS system’s success can be duplicated in healthcare. Unlike the airline industry, which encompasses a small number of carriers and manufacturers, a healthcare version of the ASIAS system would need to track data from thousands of provider organizations and types and hundreds of HIT systems. Shane Hade, CEO of emergency department information management systems provider EDIMS, concurs that a program to monitor and analyze patient safety issues with HIT is a good idea. While it is unknown how many adverse events are directly caused by HIT, he notes that as a general approach to mitigating risk, the ability to gather and evaluate technology-related safety issues is an important step as adoption expands. But he also agrees that how the data are gathered and utilized presents significant challenges that, left unresolved, could negatively impact compliance with such a program. “How do you determine if an adverse event is due to the use of technology? That area is subject to interpretation, and it could be very damaging,” he notes. “I also don’t know how you would police [reporting]. It’s going to be very problematic. That one issue could torpedo this entire thing. “Vendors will also be concerned about how to account for or necessarily determine issues that were caused by the hospital customizing away from the normal functions of a system,” Hade adds. Hade also sees serious compliance challenges with such a reporting system. First, integrating the reporting mechanism directly into the care process heightens the risk that technology will be blamed for human error, especially if providers are not completely convinced they will be protected from liability by participating. Second, stopping to report an error moves the clinician’s focus off the patient, disrupting the clinical workflow. This dovetails with a third challenge facing the successful establishment of a patient safety program: Who should be responsible for oversight and ensuring that the data collected are both valid and meaningful in the larger context of improving overall safety? Keith J. Figlioli, senior vice president of healthcare informatics for Premier, Inc, a performance-improvement alliance of more than 2,300 U.S. hospitals and 67,000 other healthcare sites, notes that patient safety laws were enacted long before the concept of meaningful HIT use came into being. So it is important that any HIT safety-monitoring program contribute to, rather than cloud, the bigger picture. To that end, Figlioli recommends that oversight be handled by an existing patient safety organization that is in a position to draw parallels between errors attributed to IT and errors attributed to other aspects of the care process. For its part, the ONC agrees that whatever form the final program takes, it should advance the goals of improving access to and the delivery of care by leveraging safe and efficient technology use. In the months since the HIT Policy Committee sent its recommendations to the ONC, the agency has been working with other relevant Health and Human Services agencies to evaluate the recommendations and develop implementation strategies. Much of the early focus is on information gathering, including evaluating whether the Agency for Healthcare Research and Quality, the FDA, or another existing safety organization is best suited to manage it. “We’re open-minded, but we’re definitely looking at where we can leverage existing approaches,” says Jodi Daniel, JD, MPH, director of the ONC’s Office of Policy and Planning. For now, there isn’t a set timetable for when the agency will issue its preliminary strategies, although the hope is that it will happen within a few months. Meanwhile, “We’re looking carefully and taking time to go through and come up with an approach,” Daniel says.